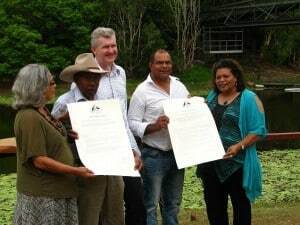 After almost 25 years since the original World Heritage listing of the Wet Tropics, on the 9th November the Federal Government formally recognised the outstanding Indigenous cultural values of the Wet Tropics National Heritage Area. Congratulations must go to all the Traditional Owners who have fought for recognition of the cultural values of the region and to protect and manage them according to their cultural knowledge. In 1988 North Queensland’s Wet Tropics was recognised for its outstanding universal natural values. At the time, no consideration was given to the wishes of Traditional Owners of the Wet Tropics region and the cultural values went largely ignored. The Wet Tropics region consists of 20 Traditional Owner groups from Townsville in the south to Cooktown in the north. With a number of Aboriginal Traditional Owner organisations and native title determinations now in the region, Traditional Owners are ready more than ever to engage in the National Heritage process, and if desired, World Heritage processes. This is a significant milestone for the Wet Tropics Rainforest Aboriginal Peoples. Many Elders have passed away while waiting for governments to recognise their significant cultural heritage and knowledge.